I’m fully convinced that what you think you think is equally influenced by both the contents of your stomach and the lack thereof. Now, when I get hungry, I try to stay rational. I know that I tend to turn mean when I’m hungry, so usually I just stop talking in order to ward off any possible offenses. I also feel dumb when I get hungry, you know? All light headed and fuzzy brained. I swear my vision starts to close in and I feel like I’m a child pretending that an empty paper towel roll is a telescope, except it’s my stomach using my eyes to tunnel my vision in on anything edible. My animal instincts kick into full gear, and I’m incapable of any lucid thought, save repairing the broken rung on my ladder of physiological needs. When I was looking for a place to live in Charleston, I happened to stumble upon a fine eatery in the midst of a reality-altering, hunger-induced stupor. I was on East Bay Street, too hungry to function, and I had about 30 minutes to kill before I met my potential landlord. I knew that I needed to eat to make a good impression, otherwise any intelligible sentence I managed to utter would’ve been drowned out by the grumbling of my stomach. Either that or I just would have passed out due to the lack of glucose reaching my brain. It was one of those kinds of hungers. So I pulled into a parking spot in front of East Bay Deli, a reasonably well-known Charleston dining establishment. I was parked in front of a window that said “Ted’s Butcherblock,” which was juxtaposed immediately with a sign reading “East Bay Deli.” I just assumed that East Bay Deli was offering meat from a place called Ted’s Butcherblock, and I walked into the door to the left of the window reading Ted’s Butcherblock. I was greeted by a deli counter full of cured meats and homemade salads and a plethora of other refrigerated gourmet goods. Turns out Ted’s Butcherblock is a separate business that’s been featured in Bon Appetit and Food & Wine Magazine. I can tell you that it was the happiest hungry mistake I’ve ever made. I ordered a create-your-own salad with house-smoked salmon, and I was super impressed by its texture and flavor. I was especially enticed by the BLT of the month, and I had my mind set on retrieving one as soon as possible, which happened to be about a week later when my parents came to help me get settled. My mom ordered the BLT of the month for August, which featured a bacon from Kentucky. 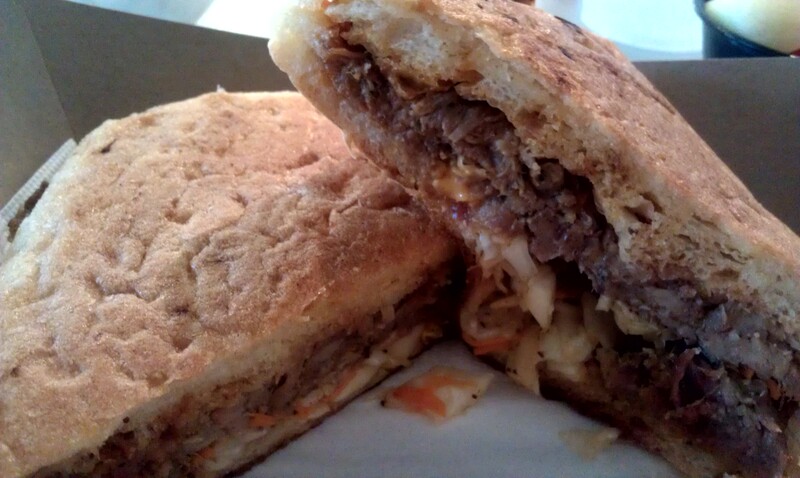 I ordered the BBQ pulled pork panini, and my dad ordered the Wagyu beef panini. Honestly, I was not as impressed by the flavor of the food on the second go-round as I was on the first. My dad thought his panini had too much bleu cheese garlic aoli, and I wanted my pork panini to have more of the cheddar cheese slaw. The bread was also a bit lackluster: flavorless and slightly too chewy. 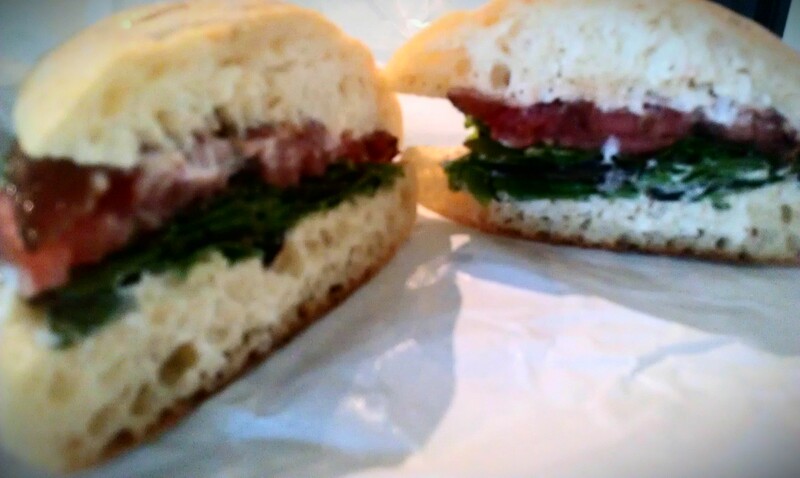 The BLT of the month was good though. The bacon was perfectly crispy, and the sandwich was well-balanced. Any store that features a monthly craft bacon receives a thumbs-up in my book. Ted’s Butcherblock also has a weekly Friday night wine tasting and a different Burger Special every Saturday. For $11, you get a burger, a side, and a craft beer. Any store that features food and beverage specials also receives a thumbs up from me. Ted’s Butcherblock is a great place to pick up hard-to-find gourmet ingredients like foie gras and duck fat as well as locally sourced seafood. They also have a wonderful cheese selection, which is exciting for someone such as myself who keeps a cheese journal. From what I can tell, it’s a great addition to the local culinary scene that caters to adventurous home-cooks. Making it to one of Ted’s Saturday Burger Specials is on my Charleston Bucketlist. We’ll see how ambition and reality coincide as I set out to complete my list as I start getting settled and exploring all that the greater Charleston area has to offer. East Bay Deli is really overpriced and overrated. They give you generic ruffles chips with your sandwich. I didn’t know that about Ted’s burgers specials on Saturday, always thought my husband would like that place. This entry was posted on September 14, 2013 by Emeliorations in Charleston, Restaurant Reviews.